| Laura Manivong: writing for teens, tweens and adults who refuse to grow old. Vonlai’s father roused him in the middle of a moonless night. “What? Stop it,” Vonlai mumbled. Vonlai wobbled on weary legs. Pah strapped a bag of beef jerky and sticky rice around Vonlai’s shoulders. A shudder shot down his neck and his mind snapped awake. Vonlai’s older sister, Dalah, was awake too, teetering as she sat upright on the mattress, grumbling at their mother. Meh pulled Dalah’s hair back, twisted two strands, and tied them into a knot. “Who will see you?” Vonlai asked. Vonlai steadied his tired body against the wall. He wouldn’t add to Meh’s worry by complaining. Vonlai’s breath wavered as he nodded. He wanted to dive under his bed-covering, even though the night air was sticky and plenty warm. He held nothing but a pair of worn flip flops hooked through his fingers and a day’s worth of food—he needed to hold on to his nerve. Maybe his parents would see he was more grown up than other twelve-year-olds. Pah turned the handle and walked out as confidently as if he were headed to the market. Meh stood in the doorway, knees locked. Vonlai pulled her hand. They all followed Pah out and slipped into the night. Most border patrol guards were teenagers accustomed to farming during daylight hours. They were likely to doze off under a black sky. Her headlights sliced through the night, a yellow blur of road lines flashing past. The desert air, warm as breath, wound her hair into spirals, circled her neck. Malia hit the brakes. Dust rose in her high beams, lingering shapeless like fog. Her only company was the hum of the Jeep. Her breaths came fast, the seatbelt cutting across her chest. She killed the engine, killed the lights. Darkness knocked into her, and her eyes pushed against black hunting for even a speck of light. When she’d arrived earlier that day to check in with her supervisor, she marveled at the sunlit desert, its plain of dry grasslands surrounded by erupting mountains, so striking compared to the rolling hills of the Midwest. She’d never felt so weightless, moving under Arizona’s massive sky with no more significance than a snowflake on fire. But at night, Malia felt connected, rooted to the landscape the way the immovable hoodoos sprouted from hilltops. As each minute passed, the sky covered Malia in more glitter. “Hello stars!” Faint currents swirled over her like butterfly kisses. Consider it a book rescue. I started writing it just before I found out I was pregnant with my first born, who is now in middle school. I got an amazing agent in 2006 whose reputation made me about faint. 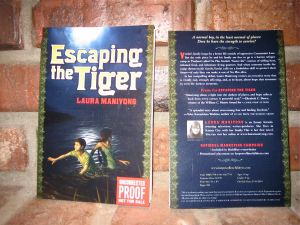 She sold Escaping The Tiger in 2007 to an amazing editor who also made me about faint. The book was born in 2010 during a book launch party at the best bookstore in the world…yes, I felt a bit faint. The reviews came in and were very nice. Very nice indeed. My hopes soared. And then it dwindled. The hope. The sales. It all dwindled, culminating with the 2013 news that my novel was out of print. Sad face. But temporary sad face. I’m kind of stubborn, and rarely take no for an answer. So I hired a cover designer to create something new, hired a formatter to do all that tricky, techie e-book stuff that makes me cra-cra and weep, and now in 2014, the e-book is born. Today is the perfect day to announce the book rescue, as it is World Humanitarian Day. 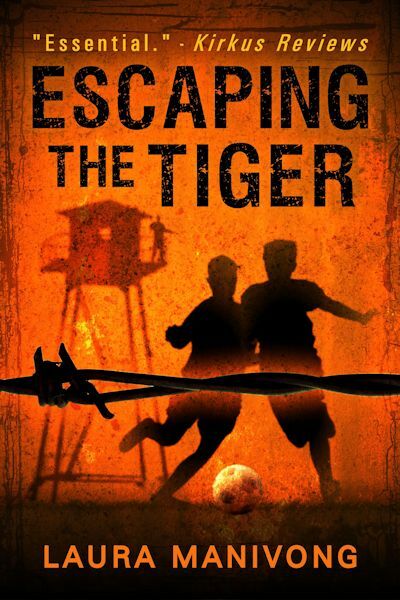 Escaping The Tiger is on sale for $.99 on Amazon. A tale of refugees, oppression, hunger, survival, soccer, immigration, bullying, feisty older sisters, mentoring, respect, dignity, and hope. For kids, teachers, coaches, social justice advocates, literature lovers. Thank you for celebrating this book birthday with me.